Fluorescent technology in barcode printing provides reliable protection from direct coping (using copy-machine, for instance) and that is why this method is particularly popular with government agencies, pharmaceutical industry, any agency in need of protecting documents from copying and tampering. Several major companies are now printing bar coded batch and lot control information on their products with this invisible ink to provide an indicator that the product is a legitimate one. UV (Ultra-Violet) or IR (infrared) fluorescent printed barcodes have become a popular method of adding security marks to products and documents. The UV illumination and enhanced optics are able to see the 'invisible' barcode marks printed with UV fluorescing inks. Fluorescence occurs when the absorbed radiation is in the ultra-violet (or infrared) region of the spectrum, and thus invisible to the human eye, while the emitted light is in the visible region, which gives the fluorescent substance a distinct color that can only be seen when exposed to UV (IR) light. 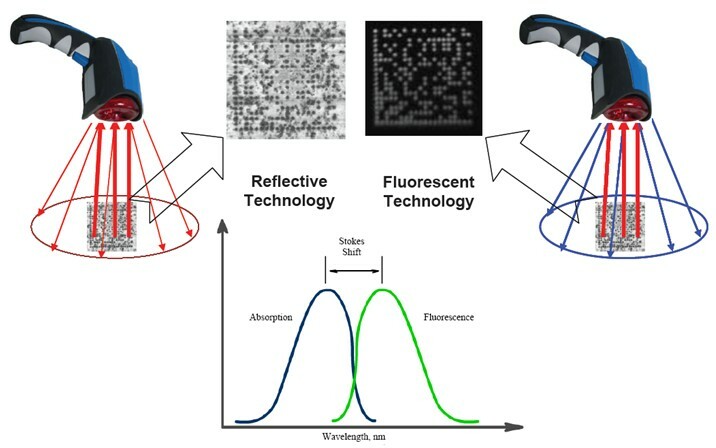 A camera equipped with a color filter will image only these fluorescent elements leading to illumination while reflected and ambient light suppressed. In addition to “security” this also improves barcode decodability since captured image quality does not depend on substrate properties anymore. Does fluorescent technology provide encoded data (content) protection? No, fluorescent technology provides protection only against direct copying of those barcode labels that are printed with fluorescent inks – barcode Validation. It does not protect the content of the barcode, though, because barcode can be decoded and “reprinted” by counterfeiter. If the data contained in the barcode mark, however, are further authenticated using 2DTG’s protection technology, you can be assured that the item is legitimate, as well as not black market distribution, when the data is sent back to the manufacturer from the distribution channel. In other words, combination of 2DTG’s authentication/encryption methods with fluorescent technology provides the best overall protection for your brand/product/ document: “Authentication - Encryption – Validation”. Can fluorescent barcode be printed on any paper media? Fluorescing inks can be printed just as easy as normal colors normally, but some considerations need to be addressed. Many white paper stocks and label materials have what is called “optical brighteners” used to make the paper appear very white in attempts to make a black or color printing on it have high contrast and visual appeal. If the desired fluorescing ink is a UV (Ultraviolet light) excited ink that glows with a bluish white nature, which is one of the most common variety, this can cause challenges in discerning the fluoresced ink on this paper that happens to also fluoresce, due to these optical brighteners. If the paper must be of this optically brightened nature, there are solutions available in the market with UV fluorescing inks that glow in the red or yellow-green spectrum. If the paper can be of a non-optically brightened nature – then the blue-white UV fluorescing inks can easily be read. Can fluorescent barcode be printed on plasticized or metalized labels? It has been a growing practice in the security industry to use plasticized or metalized labels that have holographic attributes. In most applications where these holograms are in the media, many types of UV fluorescing inks that have been printed on the top surface can be easily red. This gives the brand owner at least two types of anti-counterfeiting protection: one of the “overt” viewable hologram – authentication - and one of the “covert” (invisible to the human eye) bar code - validation. Serialized or batch controlled labeling can be done easily with these covert bar codes printed with fluorescing inks. What types of fluorescent inks are available in the market? There is a variety of fluorescent inks available in the market. Which one to choose – depend mostly on application. Most common is UV ink (375 nm) that glows in the bluish white spectrum. Another example is a UV fluorescing ink that when excited by the UV (380 nm), glows with a red nature. There are inks available from select ink and taggant companies that can fluoresce when exposed to a red illumination light in the scanner (at a very specific wavelength) to cause a fluorescence in the infrared spectrum, that is beyond the human eye’s ability to see it. How do I print fluorescent barcode marks? There are several different methods of printing these covert bar code marks. They range from a CIJ (Continuous ink jet) method that is flexible enough to print on irregular or at a varying distance from the edge of the product to TIJ (Thermal Ink Jet) printing, which is excellent when close proximity can be maintained as in label or document printing. These “dotted” barcodes can usually be very well controlled, but poor regulation of the speed of the product going by as it is printing can cause the bar code to be improperly formed. 2DTG’s DMPS software is particularly helpful in decoding such “dotted” symbols – only few decoders on the market can really “read” such codes.